Remember when a 0.2% drop in the stock market was considered large enough to merit central bank intervention? If you can't that's ok: it was never meant to be the case. Only that's not true in Japan: in recent years, every time the Japanese Topix index dropped more than 0.2% (a fifth of a percentage point), the BOJ would step in and buy ETFs to prevent what one can only assume would be a crash. Only, Mrs Watanabe and other investors are getting increasingly nervous because that's hasn't been the case recently as the BOJ appears to be growing more comfortable with larger drops in Japan's stock prices, a sign which according to Reuters suggests the bank may have started to telegraph to the market the "stealth tapering" of its massive monetary stimulus. Whereas the Chinese "national team" stepped in on Monday to send the Shanghai Composite surging in the last hour of trading, launching a global risk rally, the BOJ has remained surprisingly quiet and refrained from buying stocks on two days this week when the Topix index was down more than 0.4% by midday. This is notable because it represents a sharp departure from the BOJ's prior pattern when it bought ETFs on days when the index fell more than 0.2 percent. To be sure, the BOJ has already been engaging in a "stealth tapering" in the bond market, where it has been purchasing progressively fewer government bonds over the past year. Over the past two years, the BOJ has sharply reduced its bond buying despite statements that it aims to increase its government bond holdings by ¥80 trillion ($722 billion) a year. In fact, as the chart below show, the latest 12 month average is now barely half of the BOJ's stated target. The similar moves in its stock market operations follow last month’s announcement that it would make its asset purchases "more flexible." During the BOJ's July 31 policy decision, the central bank said it "may increase or decrease its stock buying depending on market conditions." And lately it's been decreasing. 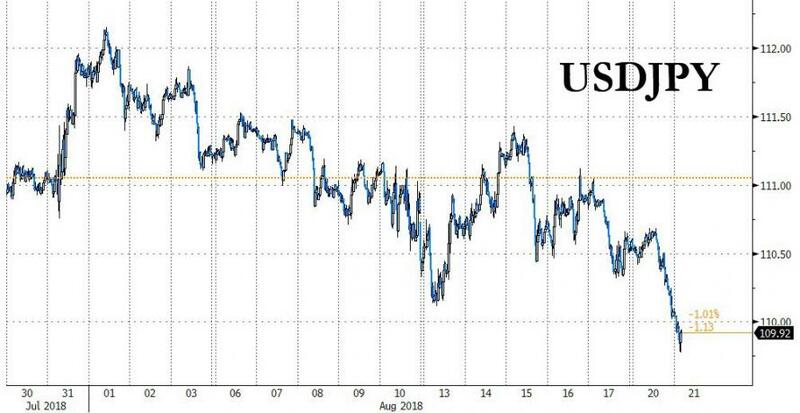 Since the last meeting, Reuters points out that the BOJ bought ETFs on only two days — Aug. 10 and 13 — when the Topix fell 0.6 percent and 1.7 percent in morning trade, respectively. It did not step into the market on Wednesday and Thursday when the Topix declines in the morning session were 0.43 and 0.42 percent. It also refrained from buying ETFs when the drop in the Topix was between 0.2 to 0.4% earlier this month. "This is not so much an alert as a red-hot warning that it is going to whittle down its purchase bit by bit,” said Shingo Ide, chief equity strategist at NLI Research Institute. "I would say that is the whole purpose of putting that line in the statement." It's unclear if the BOJ's attempt to let the market clear prices without "training wheels" will be successful this time. 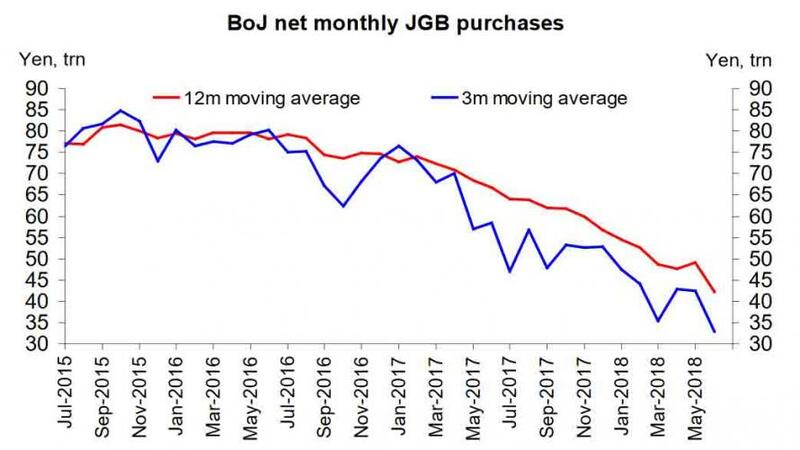 The BOJ tried to change its unwritten policy on stock market support in April and May, allowing greater price declines without buying, but just like China's latest aborted "deleveraging campaign", it switched back to its old script in late May. Some investors are desperate to believe that the BOJ still has their back, like Norihiro Fujito, chief investment strategist at Mitsubishi UFJ who does not believe that stealth tapering has begun: "Even if it doesn’t buy when the market is down 0.4 percent, it’s still possible that the BOJ will have bought ¥6 trillion by the end of the year,." Naturally, he's right, but the risk is that during a sharper selloff when the BOJ fails to appear, investors will panic and liquidate en masse, accelerating a crash. As an aside for market "purists", the BOJ bought nearly ¥3.5 trillion of stocks in the first half, more than half its annual target of ¥6 trillion, meaning it needs to buy less in the second half. And an even more shocking number: since 2013 the BOJ has bought almost ¥20 trillion worth of Japanese stocks, making it by far the biggest buyer of them. The BOJ's ridiculous equity holdings - the central bank is now by far the biggest shareholder in Japanese stocks - has raised concerns that the BOJ’s ownership in Japanese companies has become grotesquely big — a factor that many investors say prompted the BOJ to make its latest policy modification. As a result, concerns are growing: after all, the market has been barred from true "price discovery" since the great financial crisis thanks to endless central bank intervention. "If the BOJ is really reducing buying, that is going to have a considerable impact. I suspect the BOJ will try to reduce it gradually," Fujito said. And while a small reduction in market intervention is unlikely to have a tangible impact on inflation, it could substantially reduce support for Japanese share prices - read, result in a crash - and marginally strengthen the yen. The latter was on display on Monday night when the USDJPY slid below 110 for the first time since June.